ABC Community School Partnership Accepts Sponsorship from the American Federation of Teachers to Support the 2016 Coalition for Community Schools National Conference. 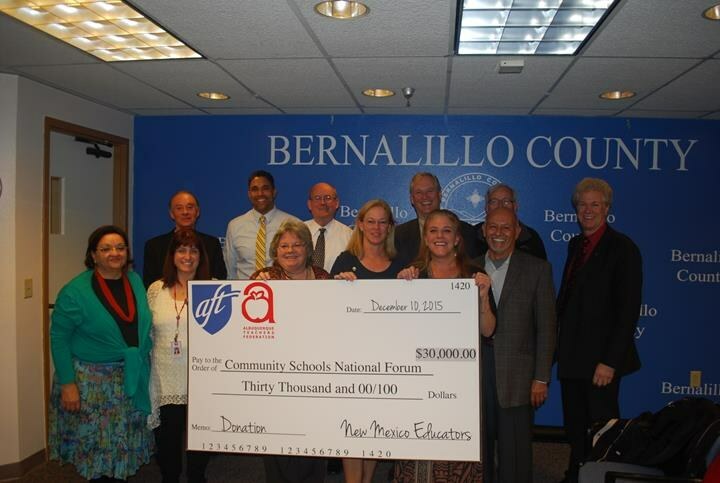 The Albuquerque Bernalillo County Community Schools Partnership Board (ABC) today accepted a $30,000 sponsorship from the American Federation of Teachers to support the 2016 Coalition for Community Schools national conference to be held in Albuquerque next year. Who is Invited to the 2016 Conference? Everyone interested in New Mexico's education system – parents, principals and teachers, policymakers, health care, business, nonprofit and social services leaders – are encouraged to register for the 2016 Coalition for Community Schools National Forum. Parents, educators, administrators, and community leaders from across the United States will gather in Albuquerque April 6-8, 2016 to learn effective strategies that help students and families overcome obstacles to learning. The conference is expected to draw an estimated 1,600 attendees, 1,200 overnight visitors and $1.2 million in direct spending. It’s one of the largest conferences in the metro area booked for 2016. What is ABC Community School Partnership? The ABC Community School Partnership is a coalition of local government, business and nonprofit leaders dedicated to helping students finish school ready for college, careers, and life. The American Federation of Teachers has been a strong partner in this successful effort, especially in New Mexico. The partnership supports community schools coordinators at 23 local schools that bring together individuals, organizations, and funding to offer a range of supports and opportunities for improved student learning, stronger families, and healthier communities. Several ABC community school programs have been recognized and replicated as national models. Major partners include Bernalillo County, the City of Albuquerque, Albuquerque Public Schools, United Way of Central New Mexico and the Albuquerque Business Education Compact. To learn more about the ABC Community School Partnership, please visit the partnership’s newly-designed website. The ABC Community School Partnership was created in 2007 through a joint powers agreement.